Looking for a perfect place to learn Narrations? If yes, here is the best place for you. Today we are sharing an important topic of English Grammar is Narrations. 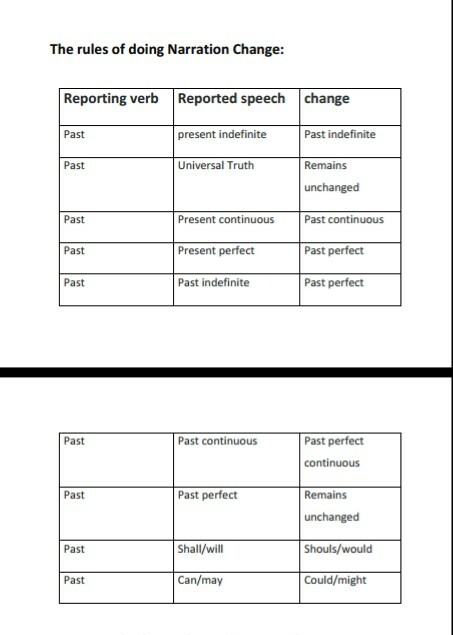 Here you can learn Narration Change Rules, Direct and Indirect speech. 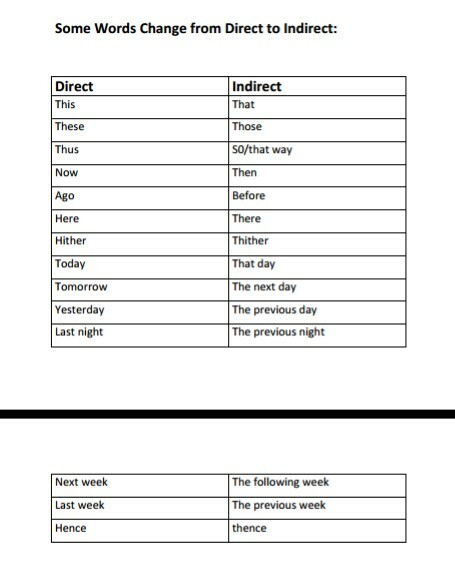 Direct and Indirect speech is very important for English Grammar. So we request to all students to read carefully this article and download pdf. Narration is the use of a written or spoken commentary to convey a story to an audience. Narration encompasses a set of techniques through which the creator of the story presents their story. Narrative point of view: the perspective (or type of personal or non-personal "lens") through which a story is communicated. Direct: Suman says, "Ayan is a good boy." Indirect: Suman says that Ayan is a good boy. Direct: Father says,"I cannot walk so fast." Indirect: Father says that he cannot walk so fast. Direct: He says,"I like mangoes." Indirect: He says that he likes mangoes. Direct: Shyam will say, "I have done this work." Indirect: Shyam will say that he has done this work. Direct: I shall tell him, " you shall not come again." Indirect: I shall tell him that he shall not come again. Direct: Tina said, "I am ill."
Indirect: Tina said that she was ill. Direct: The old man said, "God is merciful." Direct: Milan said, "I am doing sums now." Indirect: Milan said that he was doing sums then. Direct: Sisir said, "I have finished reading the book." Indirect: Sisir said that he had finished reading the book. Direct: mother said, "I took tea." Indirect: Mother said that she had taken tea. Direct: Subir said, "I was doing sums." Indirect: Subir said that he had been doing sums. Direct: He said, "I shall take rice." Indirect: He said that he would take rice. Direct: The teacher said, "Ashoka was a great emperor." Indirect: The teacher said that Ashoka was a great emperor. Direct: The boy said to me, "Is the mango sweet?" Indirect: The boy asked me whether the mango was sweet. Direct: Ram said to me, "are you ill?" Indirect: Ram asked me whether I was ill. Direct: I said to Ratna, "Do you know my brother?" Indirect: I asked Ratna whether she knew my brother. Direct: He said to me, "what are you doing?" Direct: Nanda said to me, "what do you want? " Indirect: Nanda asked me what I wanted. Direct: The traveller said, "How far is Chennai from here?" Indirect: The traveller wanted to know how far Chennai was from there. Direct: The teacher said to the students, "sit down." Indirect: The teacher told the students to sit down. Direct: He said to Sujay, "Now have a cup of tea." Indirect: He requested Sujay to have a cup of tea. Direct: I said to my brother, "Do not run in the sun." Indirect: I advised my brother not to run in the sun. Direct: The teacher said to me, "Do not waste time." Indirect: The teacher advised me not to waste time. Direct: The man said to him, "Do not disturb me." Indirect: The man told him not to disturb him. Direct: The teacher said, "Let no one tell a lie." Indirect: The teacher urged that no one tell a lie. Direct: He said, "I must go." Indirect: He said that he would have to go. Direct: Soma said,"It might rain tonight." Indirect: Soma said that it might rain tonight. Direct: He said, "May god bless you." Indirect: He prayed that God might bless him. Direct: We said, "May Mother Teresa’s soul rest in peace." Indirect: We prayed that Mother Teresa’s soul might rest in peace. Direct: Amal said, "Could I but get the prize." Indirect: Amal expressed a wish that he could but get that prize. Direct: He said, "Alas! I am ruined." Indirect: He lamented that he was ruined. Direct: He said, "what a fool I am!" Indirect: He reproached himself for being such a big fool. Direct: My mother said, "How happy I am." Indirect: My mother said that she was very happy. Direct: The students said, "Hurrah! Our school has own the match." Indirect: The students shouted with delight that their team had won the match. Direct: The teacher said, "Nabin, look at your book." Indirect: The teacher told Nabin to look at his book. Direct: The speaker said, "Friends, do not listen to false rumors." Indirect: The speaker urges the audience not to listen to false rumours. Direct: Sanu said to Sushama over the telephone, "I have got the tickets. Meet me at the station at 6-30 p.m."
Indirect: Sanu informed Sushama over the telephone that he had got the tickets and he suggested that she meet him at the station at 6-30 p.m. Direct: Surabhi said to Mohan, "Let’s but some flour. We would ourselves prepare bread at home." Indirect: Surabhi suggested to Mohan that they buy some flour and make bread themselves at home.